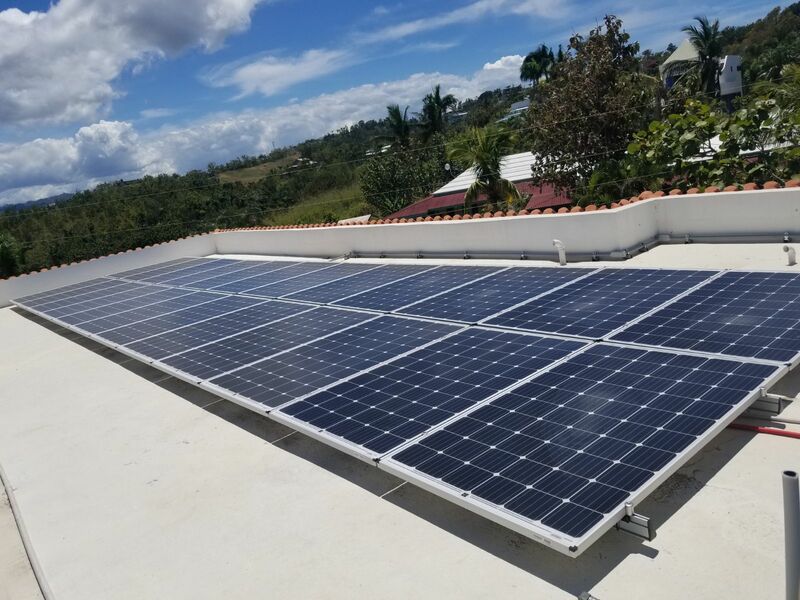 The use of solar power is on the rise in the Caribbean as a way to lower energy consumption costs and increase resiliency against severe storms. The Caribbean’s tropical climate, sunny weather, and proximity to the equator lead to long days of high-intensity sunlight. The rising cost of fuel heightens the price of traditional power sources which makes solar an environmentally and fiscally responsible choice for homeowners and business owners alike. Additionally, tourism is one of the main economic contributors in many Caribbean countries. Tourism is an energy-intensive industry that must power unpredictable loads including hotels, pools, and nightlife accommodations. Thus, Caribbean businesses are beginning to focus on photovoltaics to lower their energy costs. PV Systems also provides an opportunity for communities to increase their resilience to hurricane damage and severe weather by becoming less reliant on the utility grid and at the mercy of post-storm repair timelines. Estimates in 2017 from the United Nations state that recovery costs from Hurricane Irma and Hurricane Maria will total more than $5 billion. 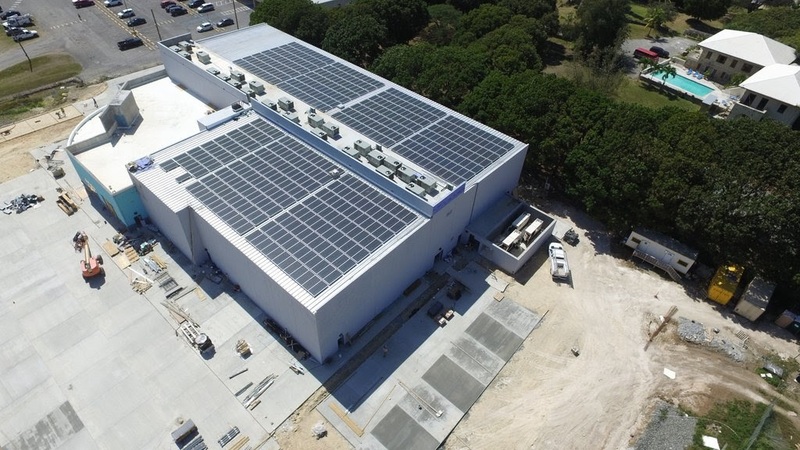 To increase resiliency, PV systems provide a cost-effective option to rebuild infrastructure. If the utility grid is nonfunctional post-storm, PV systems with storage technology provide power to homes and public buildings. Battery storage technology can power buildings for multiple days while repairs to the grid are made. Decentralization of power infrastructure through the installation of solar arrays offers quick and affordable solutions to keep communities functioning normally in the aftermath of a storm. 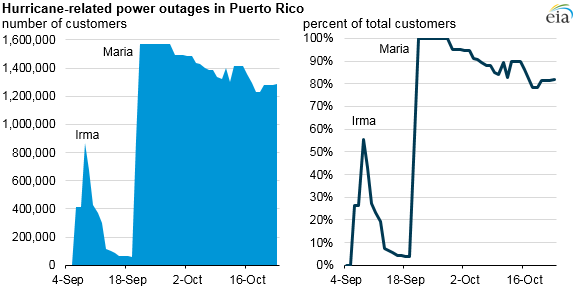 Power outages after Hurricane Maria and Hurricane Irma. Photovoltaic systems are also a smart option for the Caribbean because they are designed to withstand severe weather. Racking is designed to withstand high-speed winds and PV modules are tested to endure impact from high-intensity rains and even hail. Now, some manufacturers produce double-walled modules to add another layer of protection. Further, many warranties and insurance policies help lower the cost of repairs post-storm. Communities with decentralized power systems are more resilient post-storm because they have their own sources of power. Less damage control leads to a faster recovery time. There is also an opportunity for large public buildings that act as emergency shelters to be powered which allows for functional medical services, the preservation of perishable food and, in some cases even power air conditioning. Easier access to medical services, potable water, and fresh food helps people and communities resume regular activity post-storm. After Hurricane Maria, nearly all of Puerto Rico was out of power. According to PBS coverage, the whole town of Adjuntas was left without power except for Casa Pueblo, the local community center which also operates as an environmental organization. After the storm, this building served as a place for community members to charge medical devices and phones. The community radio station also used Casa Pueblo as a broadcasting center to provide storm updates. In this case, solar panels outlasted the power grid through the intensity of Hurricane Maria. As severe weather and high-intensity hurricane occur more frequently in the southern US and the Caribbean, efficient storm response will play a crucial role in community safety and well-being. Solar energy provides a resilient, cost-effective, and environmentally responsible option to these communities.